IF EVOLUTION’S clock were wound back and restarted, would I be here to compose these lines or you to read them? 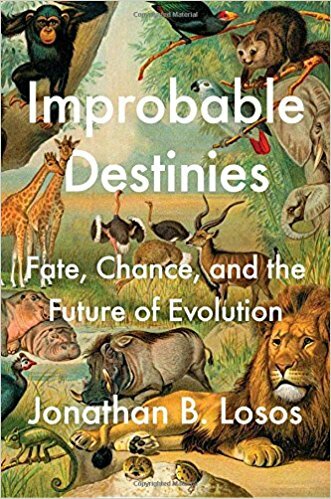 This provocative question is addressed in Jonathan Losos’ book Improbable Destinies: Fate, Chance, and the Future of Evolution, reviewed by Steven Rose’s “Coloured Spots v. Iridescence,” in the March 22, 2018, issue of London Review of Books. Improbable Destinies: Fate, Chance, and the Future of Evolution, Jonathan B. Losos, Riverhead, 2017. Evolving Evolution. A principal theme in Losos’ book is that science is not static; the theory of evolution itself is evolving with time. As an example of this, LRB reviewer Rose cites two evolutionary biologists with opposing views, Simon Conway Morris and the late Stephen Jay Gould. 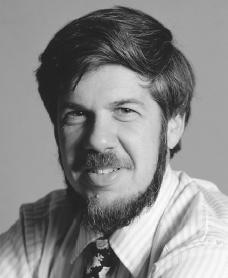 Stephen Jay Gould, 1941–2002, American paleontologist, evolutionary biologist, and historian of science. In a Gould-envisioned rerun, forget SimanaitisSays. And forget you. 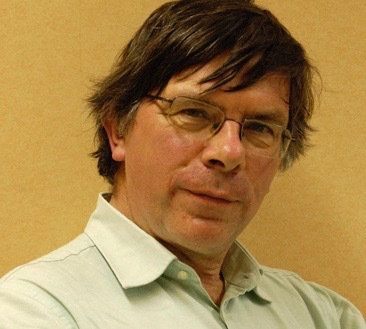 On the other hand, Simon Conway Morris is a paleontologist who disagrees with Gould. What’s more, he is known for his theistic views on biological evolution. Simon Conway Morris, Surrey-born 1951, English Paleontologist at the University of Cambridge. 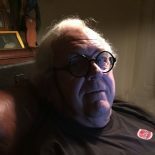 Image from christianevidence.org. Note, Conway Morris is not a “creationist” in the sense of denying evolution. Rather, he argues against science being atheistic. Gee, there may even be a SimanaitisSays to read elsewhere in the universe. That would certainly have me thinking theistically. However, as detailed in Losos’ book, recent research in evolutionary biology suggests this isn’t necessarily true. Indeed, see Darwin Comes to Town here at SimanaitisSays for reports of rapid evolutionary adaptation. Rose, a neuroscientist by profession, also discusses this “extended evolutionary synthesis” in a most interesting video. A Guppy Tale. Rose’s LRB title, “Coloured Spots v. Iridescence,” comes from experiments with the guppy, a species with “brightly spotted males and somewhat less flashy females.” This, of course, is not uncommon and thought to be a means of males attracting females when money or fancy cars don’t work. The guppy, Poecilia reticulata, is also known as the rainbow fish. Above, a male; below, a female. Image by Emilio17. Ancestors and present-day cousins of fish-tank guppies are from South American and Caribbean ponds. Some of these ponds also have voracious pike cichlids, fish preying on the highly visible, brightly colored guppy males. 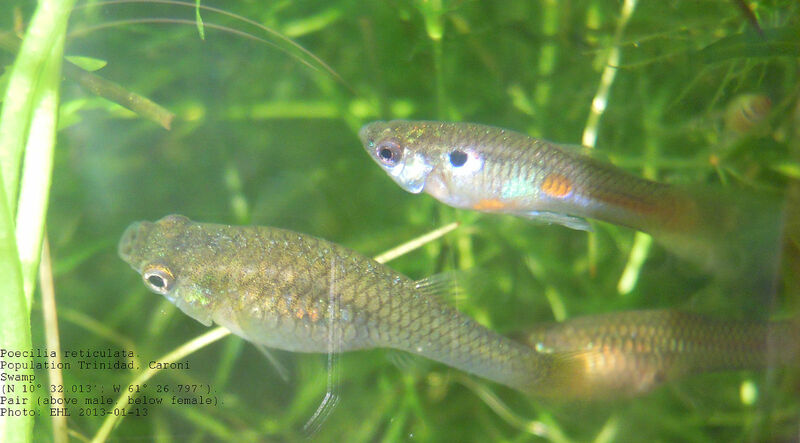 Before long, such ponds are populated with dun-colored guppies of both sexes. I’m definitely in the “can’t repeat” camp. This reminds me of a discussion a few weeks ago that I had with some other inquisitive minds about “history repeating itself,” fate, dreams and the apparent (or is it!) unidirectionality of time. The “or is it” was the most interesting. Unfortunately, we’re in a parallel universe where “Albrecht Says” doesn’t exist, so it is not documented. This entry was posted on May 9, 2018 by simanaitissays in Sci-Tech and tagged "Improbable Destinies: Fate Chance and the Future of Evolution" Jonathan Losos, evolution: chance-related or constrained?, guppy research: bright colors or dun, rewind and rerun evolution: same result?, Simon Conway Morris "The Crucible of Creation", Stephen Jay Gould "Wonderful Life", Steven Rose "Coloured Spots v. Iridescence".